For the past 18 years, our oceans have been under the surveillance of silent, blinking guardians. Known as “robomussels”, these Northeastern University devices have been used to record decades of valuable data to marine life conservation efforts. Robomussels were designed to have the same thermal proprieties as the un-robotic variety. They’re typically make of epoxy (as seen here), but smaller ones (under 4 cm) are also constructed from real shells filled with silicone. Image credits Brian Helmuth et al., Scientific Data, 2016. Every 10 or 15 minutes for the past 18 years, Professor Brian Helmuth of NU’s College of Science and the School of Public Policy and Urban Affairs and a team of 48 researchers have been informed of the internal temperatures of mussel beds all over the world. All this data was pooled from the robomussels, artificial constructs which have the shape, size, and color of actual mussels but carry built-in sensors to track water and atmospheric temperature and solar radiation levels — both of which play a part in heating up the little critters. “They look exactly like mussels but they have little green blinking lights in them,” says Helmuth. Northeastern’s Marine Science Center in Nahant, Massachusetts, houses the most extensive database of ocean temperatures around the world. It was built on the work of this team, which traveled the globe to place robomussels inside the beds of their biological counterparts. Over time, they’ve recorded staggering amounts of data, all of which is used to identify areas of unusual warming. Starting from it, scientists can intervene to protect vital marine ecosystems and develop conservation strategies to save species from extinction. But they don’t only track the effects of shifting climate. Using feedback from the robots, scientists can estimate the health of mussels in a particular area. Should they be in trouble or dying out because an area becomes unusally hot (areas called “hotspots”), local authorities can be informed to step in to relieve stressors such as erosion or water acidification before permanent damage is done. The robots are already watching. Judging. Blinking. Because they rely on external sources for heat, mussels act as a precise barometer of climate change for ecological forecasters such as Helmuth. Through a mix of fieldwork, mathematical, and computational models, he can estimate how mussels will grow, survive, or perish in inter-tidal zones. Throughout the years, the robomussels have revealed several surprising hotspots for the team. In 2002, they reported the existence of such areas not only at the mussels’ southernmost range (south California) but also up north, near Oregon and Washington state. “Our expectations of where to look for the effects of climate change in nature are more complex than anticipated,” says Helmuth. It takes constant monitoring to determine which ecosystems are under stress. Thankfully, the robomussles blink away with stoicism, watching the oceans for any sign of over-heating. “If we start to see sites where the animals are regularly getting to temperatures that are right below what kills them, we know that any slight increase is likely to send them over the edge, and we can act,” says Helmuth. 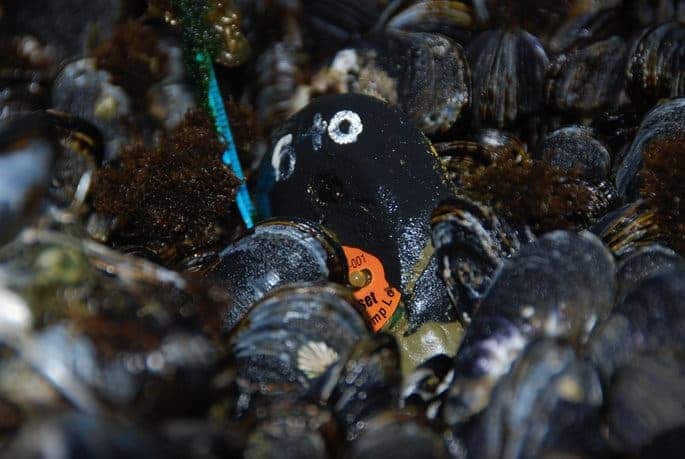 And since mussels underpin the food chains throughout their range, monitoring their health ensures a steady supply of food for everything else swimming about. The robomussels’ data can thus prove invaluable in maintaining coastal ecosystems. On a more human-centric note, they’re also good for pinpointing the best places for mussel farms. 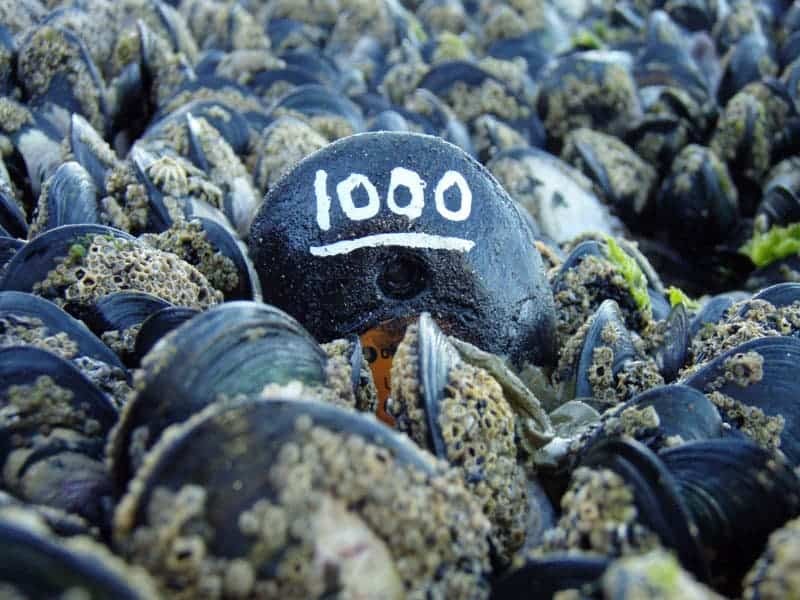 The team published a paper describing their work with the robomussels under the title “Long-term, high frequency in situ measurements of intertidal mussel bed temperatures using biomimetic sensors” in the journal Scientific Data.